The “raw” food diet (the “living” foods diet) that many people have adopted or are considering has lasted long enough to no longer be considered a fad. The basic premise of using a raw food diet is that cooking on high heats destroys many of the precious vitamins and minerals that you paid a good price for. And, if that’s not enough, it also destroys the enzymes that are important to our health. When foods reach a temperature beyond 118 degrees F they are no longer considered raw because the foods’ nutrition has been diminished. A popular trend that many raw food enthusiasts have adopted in order to keep their diets from getting boring is the use of dehydrators which add important crisp texture to foods like seeded crackers and vegetable chips as well as enjoying them as snacks. Drying fresh veggies and fruits by removing their water content is not only the healthiest way to preserve fresh food, it is also easy and cheap and a method that has been recorded and used for well over two-thousand years or longer. When you remove the water in fresh foods, you actually help to inhibit the growth of any kind of microbes like bacteria that would otherwise set in. Of course like other things, it’s always best if you can dry your own foods at home where you are in total control. Drying foods under the correct temperatures within a reasonable drying time produces high-quality nutrient-dense food. Commercially dried foods are not done under the gentle and patient conditions that you can use at home (most often they are dried at high temperatures to speed the process) and therefore are never as nutritionally valuable. Because dried fruits and veggies are naturally low in fat but high in fiber, they are also great to help with weight-loss. Even though some fruits naturally taste sweeter when they have been dried with the water removed, the caloric value stays the same as when it was fresh…the sugar is just concentrated now. Enjoying home dried foods help to keep your weight in check while your energy levels soar. The more raw foods you begin to enjoy the more you will want to eat. 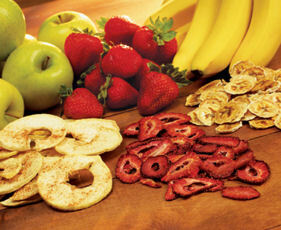 Keeping fresh dried raw fruits and veggies handy will help to spare you from snaking on junk. When employing the home drying method using a dehydrator, your food retains virtually all of the vitamins, minerals, proteins and enzymes it started with. The temperature inside your dehydrator effects the drying time. The lower the temperature, the longer the drying time. Be aware that if your temperatures are too low your food will spoil and the longer the drying process takes, the more it’s exposed to air which causes it to lose vital vitamin C. However the higher your drying temperature is, the more your food enzymes are destroyed and lost. In order to retain these enzymes, be sure not to dehydrate with temperatures above 115 degrees F. Although all enzymes die at different temperatures, most succumb when the temperatures reach 120 degrees F.
Remember, when you are testing for dryness, that warm food will have a softer feel. Allow your foods to cool for a short while by removing the drying tray from the dehydrator or turning the unit off. A general rule of thumb is it is always better to over-dry than to under-dry your foods because with dehydrating its literally impossible to overdry food. 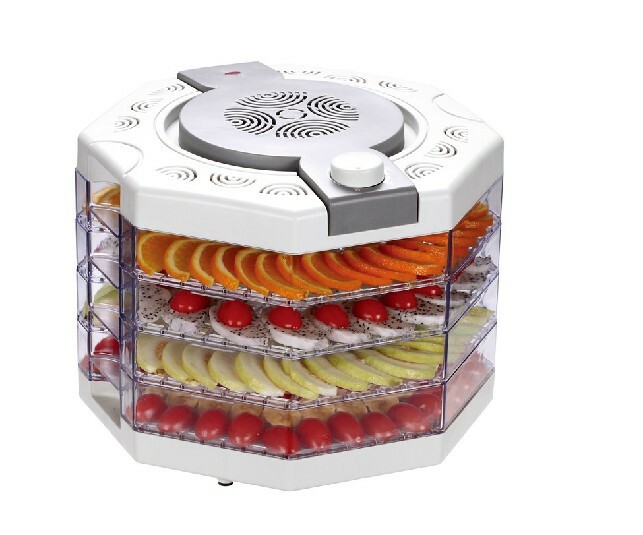 Once your food is sufficiently dry, you will not do any harm to your food by leaving it in the dehydrator longer. One last thing you need to be aware of is that moisture is your dried foods biggest enemy. When dried foods get exposed to air, they become limp and wimpy. Be sure and store your fresh dried foods in air-tight containers, moisture-proof jars, and or zip-lock bags and store in dry, dark places with moderate temperatures. Stored behind a cupboard shelf is a better option than an open lit pantry. If you see or experience any kind of mold on your dried foods caused by moisture, toss them immediately. Isn’t is time to throw away everything you presently believe you know about dieting and exercise and learn what it really takes to win the weight loss battle once and for all? “Stop Weight Loss Resistance” teaches you why your mind and body must be healthy first if you want to lose weight and keep it off forever.